Townsendia are small hardy perennials that reach from 10 to 20 cm in height. 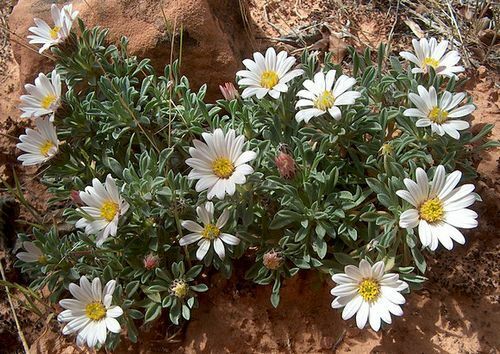 Their small size makes them an ideal plant to grow in rock gardens. Townsendia have narrow leaves and bloom from spring to summer. They carry flowers that are reminiscent of Asters; these may be pink, white or purple and often have a yellow centre. Townsendia incana - Hoary Ground Daisy by pellaea. Life Cycle: Hardy perennial. Some annuals and biennials. Height: 3 to 8 inches (7—20 cm). Flowers: Spring through to summer. Flower Details: White, purple, pink, blue, yellow. Daisy-like ray and disc florets. Showy. Foliage: Wide variation in appearance. Some plants are erect whilst others have a more prostate nature. Rosette. Linear, or lance-shaped. Rough hairs. Sowing: Cover seeds. Germination time: one to three months. Spacing 3 to 6 inches (7—15 cm). Seed: Method 1: Seeds should first be sown into flats in the autumn. Next sink the flat into the ground in an area that offers shade, preferably close to a wall that faces north. Provide a glass/plastic covering. Keep an eye on the flats to ensure that the soil remains moist. Bring the flats indoor at the beginning of spring and keep at 60°F (16°C). Transplant seedlings outdoors well after the last frost in spring. Seed: Method 2: In the spring, sow seeds in a moist growing medium, in flats. Then wrap in a large plastic bag, and stratify by refrigeration for three weeks. Next bury the flat as described above. Transplant them to their final location in the autumn. Requirements and care: Full sunlight. Excellent drainage. Gritty. Moist soil. Propagate: from seed. Miscellaneous: Genus was named after the American banker and amateur botanist David Townsend. When growing Townsendia from seeds it is best to first sow them in flats. This can be done in the autumn (bring indoors for the winter) or spring. If starting in spring the seeds should first be refrigerated. To do this, sow the Townsendia plant seeds in the flat and lightly cover, then put the flat in a black plastic bag and place in the fridge for about three weeks. The flat should then be sank into a shady part of the garden and covered with glass. Once the Townsendia seeds have germinated allow them to grow a while and transplant to their final location in the autumn. Plants like to grow in sunny areas of the garden that have very good drainage; therefore the soil should be gritty and moist. The Townsendia plants should be spaced at about 10 to 15 cm apart. It is important to keep an eye on Townsendia in the winter; they do not like to get too wet, so it is best to surround the plant with gravel. If you require more plants then it is usually best to propagate from seed.